Next morning, we had to start early as it was the first day of the training and we had a line of engagements to attend to. The day started with breakfast at Ocho’s in Hotel Havana. This is a heritage hotel from 1976 and maintains its aura on the sidelines of the city. On returning, we registered for the training and got the name tags and material needed for the next three days. Next, all I remember is a chain of sessions – theory, lectures, activities, interaction and loads of food – a 5 course sit down dinner at Grand, a buffet dinner hosted by a partner, buffet lunches, and snacks. All in all, it was food and learning that were heavy for the next two and half days. We got a chance to stroll out a bit during this time but were mostly confined to the hotel because of the tough schedule. On 21st, when the academy ended, we wrapped up the stay with a hosted lunch and checked out of the hotel. As everything was being taken up by the organization committee we had a smooth sail out of the hotel. 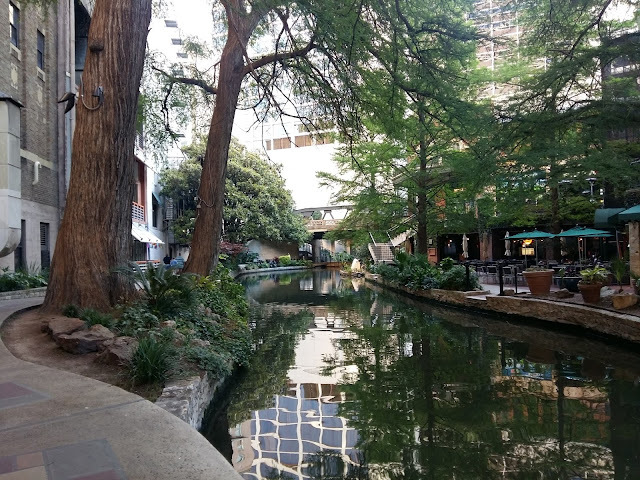 I had planned my stay in San Antonio itself for next two day but had chosen a different hotel with an aim to be nearer, than I already was, to all the action. So I headed straight to the princely charming building right by the river – it was the Hyatt Regency. As I entered my room on the 11th floor, the view of the river was simply mesmerizing and the backdrop of the city promised a good view. It was a nice and cozy room with a good setup and all required amenities. The lower base of the hotel building was the river walk itself and the door opened to the river. It was a perfect place to spend mornings and evenings. After settling in for some time and wrapping up office work we set on our endeavor to explore the city. First stop was Alamo – the place that no tourist in the city can avoid. We spent some time outside the monument as the entry was closed for the day. We made it a mental note to return the next day. Next, we went to San Fernando Cathedral – the most open and flexible church of the region. The beautiful old San Fernando Cathedral traces its origins to 1731 when 55 settlers arrived in San Antonio to expand the community as a bulwark against French incursion. This is said to be the oldest standing church building in the Lone Star State - Texas; the cornerstone was first laid years before the Alamo church was built. This church towers with history and lore at the heart of the city's center. The cornerstone of the existing structure was laid in 1738 and it has played a key role in the history of San Antonio, Texas and the nation ever since. In fact, the dome of the original church was the point from which all mileage in Texas was originally measured. Later we spent time exploring various parts of the city. As tourists, we would pose at each building which would stand apart from the rest in tiniest of manners and have a picture clicked. Two interesting buildings we covered as part of this ritual were the City/County Courthouse and City Hall. The former was huge building painted in red which stood steadily beaming a view across the city. City hall was a contemporary design, with a lot of activities happening around it. Post this, we headed to the River Walk for a nice long stroll by the water across the narrow curving pathways running through the town. After the stroll, we hopped onto the River Cruise Tour which took us through the entire river and the guide explained various points of interest along with a brief history and their significance. Next day, I started early in the morning and went to the river walk for absorbing cool fresh breeze along with the excellent views. The silence, the hustle of morning activities, the freshness in everything was simply made beautiful by squawking ducks and flowing water. The entire scene was simply mesmerizing and had the intensity to create a long impression. I spent over an hour in nature and enjoyed every bit of it. And I did ensure to capture as many pictures as I could during this time. Next, I worked for some time as it was still a working week. Later we went to Alamo for a second visit as the monument was closed for entry the first time we tried. This is an important site and is considered the symbol of Texan independence history, a memorabilia of sorts for rebellion against Mexico. A crumbling Spanish mission, the Alamo complex was seized by Texas troops in 1835 as the province rose up in rebellion against the government of Mexico. The siege was one of the defining moments of American history. However, Mexican troops stormed the Alamo from all sides, breaking through the battered walls and cornering the surviving defenders in the buildings of the mission. The fall of the Alamo was bloody and brutal. In 1845, the United States annexed Texas. For many years afterward, the U.S. Army quartered troops and stored supplies at the Alamo. Later, the state of Texas purchased the Alamo and turned this into a museum showcasing weaponry, equipment, dresses and other memorabilia. Across three halls the museum brings to life, the entire history of Texas. The Alamo is now a shrine to Texas Liberty standing strong in the center of Downtown San Antonio. As a tradition, military units perform various rituals in the forecourt of the monument. After coming out of this historic marvel, we witnessed the Battle of Flowers parade and spent some time on the streets cheering to and with partying Texans. The entire crowd was eclectic and immersed in the mood of enjoying this special time of the year. Once we returned to the hotel, I continued enjoying the view from the room which incidentally provided a clear view of the parade route. After due rest, we began the second round of tourism for the day around 4:30 PM. The first step, this time, was the Fiesta Celebratory Grounds where we enjoyed a performance of bands over the rhymes of drums and drinks. We did a bit of jig immersing into the party mood of the city. It was some real fun that we had there. It was already almost a week away from home and we were all craving some Indian food. A quick query at the hotel reception had earned me a recommendation for Sims Indian Cuisine. It took us about half an hour of a bus ride on city public transportation which was another experience of the city life. We returned late from the place and retired to bed which wasn’t unusual after a good filling meal. Next morning I woke up to the fact that this was my last day in the city. I went for another morning walk by the riverfront, shorter than the previous day but still the same fun. After the walk, I went across to the River Center Mall for some souvenir shopping which later continued at Market Square – went there to experience the local market and pick some stuff as memorabilia. 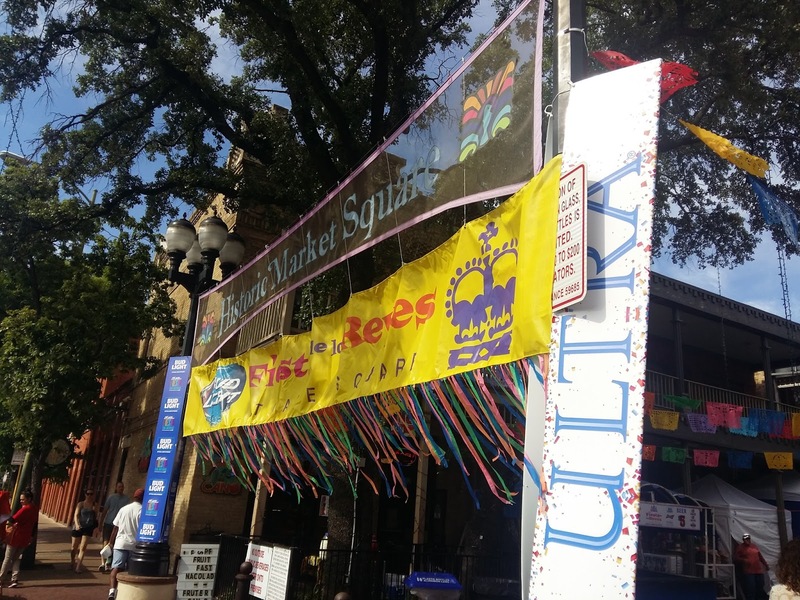 Market Square or El Mercado is the largest Mexican market in the United States. Spread over three-block area lined with restaurants, shops and activity stops, the various plazas at this historic market centers abound in rich heritage and culture of San Antonio. After a bit of shopping, I dropped my bags at the hotel reception, checked out of the hotel and joined Manas for a visit to the Tower of Americas – the top of the hill country. 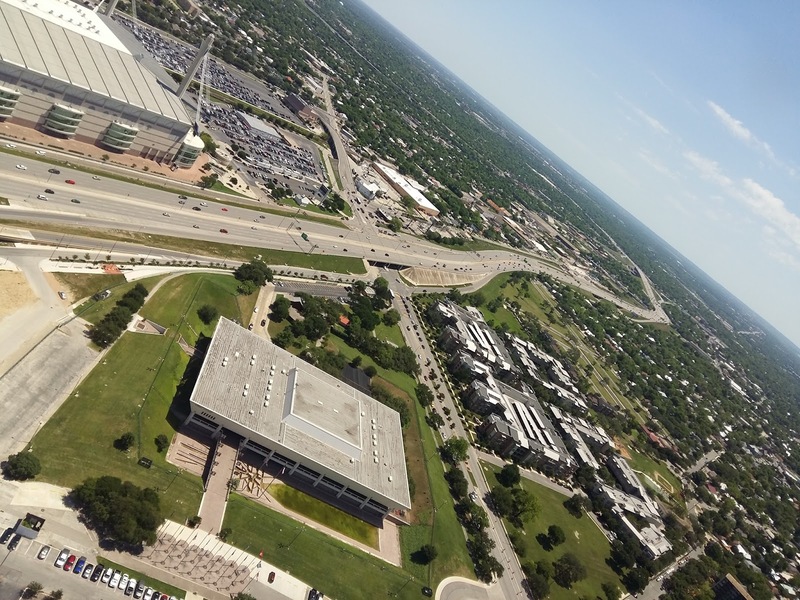 A look at San Antonio from the top of 750 feet high observation deck provides you breathtaking views of the entire region. You could have a view of a helicopter flying at an altitude lower than yours and have the thrill of whooshing cool winds across your face. We spent over an hour at the top of the tower and then returned back to the hotel. At this time, I bid goodbye to Manas and left for the airport. I had a flight to catch so that I am in Seattle for another leg of touristic pursuits and new experiences.